Written by Tara Robinson on April 30, 2018 . A third federal judge has issued a new DACA ruling. While the first two injunctions re-opened the program for the foreseeable future, this order is the first time since September 5, 2017 that there’s been a glimmer of hope that the Department of Homeland Security could be ordered to resume taking new DACA applications – and not just accept renewals. This opens up new opportunities for eligible Dreamers who are struggling to make ends meet without a work permit and are in fear of their safety and stability. With no viable Dream Act making its way through congress, the current DACA program is one of the only rays of light. Within 90 days – per the court order – we should know more from DHS and the courts about what will come to pass. But instead of just waiting, we are taking action to help more people adjust their immigration status as soon as they can. With rising ICE raids, toxic stress and fear rampant in immigrant families from so many heartbreaking cases of families being torn apart, we must do what we can to help right now. DACA renewals continue to be accepted. If you are able to renew, we recommend doing it as soon as possible. If you need financial assistance, we’re here to help. No new DACA applications are being accepted (but stay tuned – we will know more in the next 1-3 months). You might be eligible for other ways to adjust your immigration status. We recommend connecting with an attorney through Immi.org to see if you might be eligible for legal permanent residence or other programs. Offering 0% interest loans for DACA, TPS, Green Cards, Citizenship & more to California residents. Learn more. Providing fee assistance & referrals to people facing extreme economic hardship. Contact us for more info. Hosting trainings on starting your own business (a viable way to have a job if you don’t have a work permit). Sign up now. 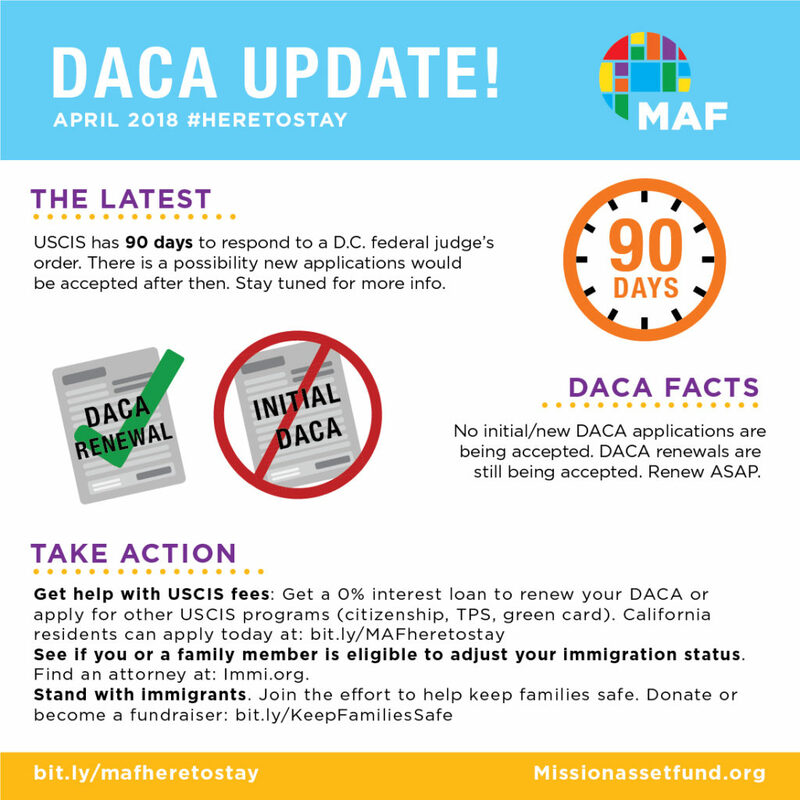 Share the knowledge: Encourage family and friends to renew their DACA now or start preparing now in case DHS starts accepting new applications in the next few months. Stand with Immigrants! Help us keep these programs going by donating or encouraging your friends and family to donate. Start a fundraiser with your friends or join a team of fundraisers and send a message to the world that you stand with immigrants! Written by Tara Robinson on September 22, 2017 . San Francisco, CA – September 22, 2017 – Mission Asset Fund (MAF) today announced it has surpassed its original fundraising goal and will now be able to provide $2,500,000 in scholarships to 5,000+ Dreamers to pay for DACA renewals by the October 5 deadline. Early this month, the Trump administration announced that the Deferred Action for Childhood Arrivals (DACA) Program is ending. DACA has provided security, safety, and a livelihood for 800,000 young people commonly known as “Dreamers.” Of the 154,000 Dreamers eligible to renew their DACA permits before the program ends in six months, most will be able to cover the application costs themselves. For those Dreamers who are eligible for renewal but can’t afford the $495 application fee, MAF is stepping in with a solution now available nationwide: scholarships to help Dreamers renew their DACA status (LC4DACA.org). Between now and the October 5 deadline, MAF will provide 5,000+ Dreamers with scholarships of $495 to renew their DACA permit. 3,000+ scholarships across the United States have already been issued to DACA recipients through this fund. Dreamers are urged to not delay – sending in their applications before the October 5 deadline is crucial – get a scholarship in 48 hours at LC4DACA.org. Capital to finance these scholarships come from the DACA Renewal Fund, launched earlier this month with growing support from the philanthropic community. DACA recipients with a permit expiring between now and March 5 across the nation are eligible to receive the scholarships. As time is of the essence, this online scholarship will be processed within a day, with same-day checks available in San Francisco and by overnight mail in other parts of the country. Philanthropic supporters of this fund include: the Weingart Foundation, The California Endowment, The James Irvine Foundation, The Marin Community Foundation, The Klarman Family Foundation, The Crankstart Foundation, The Chavez Family Foundation, The San Francisco Foundation, The Department of OCEIA in SF, and from the generosity of individual donors across the country. Written by Tara Robinson on March 16, 2017 . Building a wall, the Muslim and refugee ban, sanctuary cities, an uncertain future for DREAMers: under the current administration, immigrants from all walks of life are under attack. In February, NPR reported that even green card holders are afraid; they’re now applying for citizenship at unprecedented rates. That’s because citizenship offers protection and security. America has a long history of welcoming people from all over the world. During the last decade, the U.S. added more than 6.6 million citizens into the fabric of our nation, with 730,000 in 2015 alone. But there are many people eligible for citizenship who don’t apply. One of the biggest barriers? Cost. Lending Circles can pave the way to opportunity. In the 2017 State of the State Book, Governor Cuomo makes a commitment to protect the safety, security, and dignity of immigrants. In just a few months, nonprofits in New York State will be able to offer Lending Circles loans to people who can’t afford to become citizens or lack access to financial products. Why is this work critical? Because immigrants represent one out of five New Yorkers and contribute significantly to the state’s economy as business owners, workers, consumers, and taxpayers. Nearly one million New Yorkers are eligible to become U.S. citizens, but many are unable to do so because they cannot afford the $725 application fee. While some qualify for fee waivers, this cost barrier stands between 158,000 New Yorkers and citizenship. MAF is proud to join forces with the good people of the State of New York to pave the way to financial security for New Yorkers through 0% interest loans. Get informed. Check out the State of the State book (page 172). Get invested. Any new expansion or effort requires new support. Help us build our Lending Circles community in New York! Curious about our NY partners? Written by Tara Robinson on December 2, 2016 . When MAF was founded in the Mission District of San Francisco in 2007, the vision was always to grow. MAF’s leadership and supporters saw the potential of taking Lending Circles to communities across the country, to make affordable, safe loans and credit-building opportunities available to as many people as possible. And oh, how we’ve grown! Since 2007, MAF has grown into a national network of over 50 Lending Circles providers in 17 states (and Washington, D.C.) across the country. The Lending Circles Summit that took place in October was an opportunity to learn, to share strategies, and, of course, to celebrate. And celebrate we did. Lunchtime on the second day of the Summit was a formal affair: Elena and Mohan, Directors of Partners & Programs, gave out 12 awards to exceptional Lending Circles partners. The prizes: custom-made action figures. Some squads are legendary, like The Teenage Mutant Ninja Turtles. The Squad Award goes to the 7 outstanding members of MAF’s newly formed Partner Advisory Council (PAC) who have pooled their talents and strengths to form an unbeatable squad. This partner has proven that big things can come in small packages. This award goes to a partner with a small staff that has worked together exceptionally well to create big results. This is a partner that understands that the prescription for vibrant relationships is a good laugh. From movie nights to scavenger hunts, this organization remembers to keep it fun. We recognize this partner for cultivating a meaningful culture with roots in humor. One of the most known and recognized, this partner continues to “spread its wings” with Lending Circles and soar very high with a 0% default rate and over $125k in loan volume. This partner is newer on the scene, but has already proven itself as an adept user of The Force like Finn and Rey. They advocate for their community, ask great questions, and continue taking on new challenges in the spirit of serving their clients. This provider has flexed its Lending Circles muscles by running three different programs: Lending Circles, Lending Circles for Citizenship, and Lending Circles for Deferred Action. This heroic provider works with many immigrant women who are establishing economic independence in the US for the first time. The Falcon Award goes to a Lending Circles provider that really knows how to speak up and “Tweet!” This award goes to an organization who is actively sharing creative, informative (and bilingual!) content, both about their programs & about relevant news and current events. This relatively new provider has hit the ground running so fast that if you blink, you might miss them! They formed four Lending Circles within their first five months. We’re blown away by this world record for speed and excited to see what more is in store. This “friendly, neighborhood” superhero uses all tools at their disposal – social media, press opportunities, referrals, and creative events like Lending Circles brunches – to cast extensive webs of relationships. They even describe Lending Circles outreach as “a breeze”! This learned and wise partner was one of the first to join the Lending Circles network. Since then, they’ve amassed a wealth of knowledge. But what’s even more amazing is how generous they are with their expertise. Just like Yoda, they are a mentor and coach, and they spread their wisdom across the galaxy. Check out this tech-savvy superhero! They’ve really figured out how to combine technology and social justice. In addition to offering Lending Circles, this organization regularly partners with FinTech startups to offer their community members new apps to meet their clients where they are and help them reach their financial goals. Written by Tara Robinson on December 1, 2016 . 1. This amazingly smart team built a prototype of a “Document Drone” to make sure that forgetting your bank statement at home wouldn’t cause unnecessary delays for hardworking clients at the Go Go Gadget Arm: Build an App with Design Thinking Workshop hosted by Catapult Design. 2. You gotta love this high-flying #LCHero sneakily enlisting the help of her friend to make her cape fly! First glance at this, and I didn’t even realize there was a hand there. 3. When the Yoda Award (for “Sharing a Wealth of Wisdom”) was awarded to the SF LGBT Center. Yes! Leisa Boswell said it best at the opening night reception: “The LGBT community has always been one of chosen family. We have had to take care of each other when our given families would not. Communities take care of their own.” Speak, Leisa, Speak. 6. When Holly Minch from Lightbox Collaborative was literally jumping during her True Heroes: Engaging Clients in a Digital Age panel. This woman loves a good GAME Plan! There’s nothing like that kind of energy. 7. When you got to demo the Lending Circles App! Right? You might have been confused – was this a nonprofit or tech conference? Sidenote: We also got to hear Santos (his lovely mug is in the App banner) speak on the How to be a Hero of Your Own Story panel, and be upfront about how his mom made him do Lending Circles. Listen to your mother, folks. 8. When Mohan enthusiastically wore the “predatory lender shark hat” at the MAFterParty. It was weird. It was funny. But it also made for a very fun raffle experience. Here he is with Rob Lajoie from Peninsula Family Services winning the raffle to see a show at BATS Improv. 9. When the Lords of Print set up their screen printing station for t-shirts. It was seriously like watching Bumblebee transform back into a car. 10. José’s keynote address included an unexpected twist: he led the group in a brief guided meditation to launch us into the conference with open hearts and minds. 11. Oh the Pins, oh the Flair! Amazing superhero pins designed by Raul Barrera took off. Attendees won them for collecting business cards, speaking up and asking interesting questions, playing games, and completing challenges. 12. When Isabel from El Buen Comer shared tasty delights and an amazing story about food, family and love. Foodie tip: She has arguably the best Chilaquiles Verdes in all of SF. 13. Lending-Circles Fueled Chocolate Tres-Leches Cupcakes? Yes please. Missed out on this action? You can visit Elvia at La Luna Cupcakes in Crocker Galleria in SF. 14. #FutureisFemale all-woman panel Using Tech for Good at the Federal Reserve featured dynamos Mae Watson Grote, Megan McTiernan, Alexandra Bernadotte and Karina Moreno. Go, ladies! 15. When Judy from Fremont Family Resource Center responded responded to the question “Why is the lending circle program important to you?” with “It works!” Simple, yet persuasive. 16. When we saw six lightening fast tech demos in The Flash: ‘Super Speed’ Demos Showcasing Tech for Good workshop – from saving with EARN, coaching with Beyond 12, fighting payday lenders with Nerdwallet (pictured below), getting organized with Box.org, fundraising for good with Classy, and even using SMS to send a billion messages for good with Twilio. Ready for the next one in 2018!? Written by Tara Robinson on September 22, 2016 . Today, the MacArthur Foundation announced this year’s class of MacArthur Fellows. Among the short list of esteemed awardees is José Quiñonez, Founder and Chief Executive Officer of Mission Asset Fund (MAF). The announcement has been covered by news outlets including the New York Times, the Washington Post, and The LA Times. The MacArthur Fellowship, often referred to as a “genius grant,” recognizes those with exceptional creativity, a track record of achievement, and the potential for significant contributions in the future. Each fellow receives a no-strings-attached stipend of $625,000 to support awardees’ pursuit of their creative visions. Since 1981, fewer than 1,000 people have been named MacArthur Fellows. Fellows are selected through a rigorous process that has involved thousands of expert and anonymous nominators, evaluators, and selectors over the years. Past fellows have included notable individuals like Henry Louis Gates, Jr., Alison Bechdel, and Ta-Nehisi Coates. “This award is a high honor that recognizes the ingenuity of people who live in the shadows, who come together to help one another to survive and thrive in life. The award lifts up what is right and good in people’s lives – the trust and commitment they have for one another,” says Quiñonez. 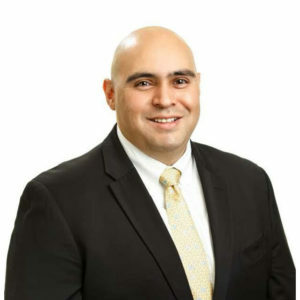 José A. Quiñonez is a financial services innovator creating a pathway to mainstream financial services and non-predatory credit for individuals with limited or no financial access. A disproportionate number of minority, immigrant, and low-income households are invisible to banks and credit institutions, meaning they have no checking or savings accounts (unbanked), make frequent use of nonbank financial services (underbanked), or lack a credit report with a nationwide credit-reporting agency. Without bank accounts or a credit history, it is nearly impossible to obtain safe loans for automobiles, homes, and businesses or to rent an apartment. Quiñonez is helping individuals overcome these challenges by linking rotating credit associations or lending circles, a traditional cultural practice from Latin America, Asia, and Africa, to the formal financial sector. Lending circles are typically informal arrangements of individuals pooling their resources and distributing loans to one another. Through the Mission Asset Fund (MAF), Quiñonez has created a mechanism for reporting individuals’ repayment of small, zero-interest loans to credit bureaus and other financial institutions. MAF participants are able to establish a credit history and gain access to credit cards, bank loans, and other services, and lending circles focused on youth provide individuals with fees for Deferred Action for Childhood Arrival applications and apartment security deposits (which are particularly needed by youth aging out of foster care). All participants are required to complete a financial training class and are provided with financial coaching and peer support. Since the lending circles were established in 2008, participants’ credit scores, collectively, have increased an average of 168 points. Quiñonez has established a network of partnerships with the financial services industry to enable other organizations to replicate his approach. With Quiñonez and MAF providing the technology necessary to disperse and track loans (a significant hurdle for many nonprofits) and assisting in securing local partners and investors, 53 nonprofit providers in 17 states and the District of Columbia are now using this powerful model in their communities. Quiñonez’s visionary leadership is providing low-income and minority families with the means to secure safe credit, participate more fully in the American economy, and obtain financial security. Written by Tara Robinson on July 28, 2016 . MAF’s 2015 Annual Report Building Better tells the story of what’s possible when we continually challenge ourselves to build better partnerships, better technology, and better programs. Thanks to our funders, donors, board, and clients across the U.S., together we’re building better solutions to unlock the full economic potential of communities living in the financial shadows. Thank you for building with us to make that possible. Written by Tara Robinson on June 27, 2016 . It’s about keeping it real. As we grow and evolve, we know that engaging real people will be key to gathering feedback that improves and informs programs and products. With this in mind, we set out to form our very first Member Advisory Council (MAC) earlier this year. The goal? To encourage dialogue among clients who use our programs and take a closer look at their experiences. The Member Advisory Council will provide advice on new programs, the client experience, and will help shape our strategic goals. Last month the Member Advisory Council, made up of 8 of our clients (a.k.a. members) representing the diversity of our community met for the first time. We sat down to get to know one of those members, Santos, and to hear what MAC means to him. I grew up in the heart of District 9, most commonly known as “La Mission”, at 26th and Valencia Streets, where the intersections saw me grow and become who I am now. Growing up in La Mission, it gave me perspectives that you don’t get to see or experience in other Districts in San Francisco. La Mission is full of cultures from every corner of the world. We have locals that are very outspoken, that are not afraid to speak against injustice. Growing up with some of the La Mission ideals, I wanted to do something for my community, something that could teach – or how we say it here in the Bay, “Speak some game” – to the younger generations. So I started working for the Bay Area Urban Debate League. As the regional coordinator for San Francisco, I am in charge of all the programs that the League has here in San Francisco. I work primarily with the High Schools such as Mission High School, Wallenberg High School, Downtown High School, June Jordan School for Equity, and Ida B. Wells High School. Why did you join the Lending Circles program? I joined a Lending Circle because my mother thought it would be a good way to start generating some credit. At first I was skeptical. I knew what a Tanda was but those were sometimes sketchy and didn’t always work out. Fast forward to 2016 and I have done 3 or 4 Lending Circles. One of the things that I enjoy the most about the Lending Circles is the finance class you have to take. It is a requirement to take the class every time you join a Lending Circle. The constant reinforcement of financial education is key. I’ve learned so much from that constant reminder. I’m constantly trying to get people to join the program. I usually just show them the website and tell them a bit of my story. What was your reaction when you learned about MAC? When I got the call, I didn’t know how to react. I happened to be on the roof of my building when I got the call. The call came in as a breeze of air, it was like deja vu. When I spoke to Karla about becoming part of the first group of MAC members, it was a no brainer and I immediately said yes. What part of MAC is most exciting to you? One of the things that Is really interesting to me is that you get to represent a community. You get to speak for the people that cannot be heard. That’s a power that not everyone gets to feel. The decisions that MAC members will make, will affect the community and that’s what’s really got my attention. The fact that I get to experience and be a direct decision maker for the community is beyond my dreams. With the help of the seven other members we can make our community better. The first generation of MAC members will set the standards for the next generation and so on we will build a group that prioritizes the community. MAC’s next meeting is scheduled for August 3rd where the group looks forward to discussing their goals for the coming year. Earlier this year, MAF had the pleasure of welcoming three new members to our Board of Directors. Read on to find out who they are, where they’re from, and what inspired them to join the board — from the cutting-edge technology driving Lending Circles to our innovative model for building financial capability. Dave Krimm is a seasoned financial services professional, with a passion for the “positive impact of microlending: the difference that a small loan can make in an individual’s or a family’s success.” His experience working as a financial product development consultant and leading fundraising and marketing at the San Francisco Foundation make the MAF Board a perfect match for Dave. Dave is no stranger to nonprofit boards. He knows just how crucial financial health is for building strong, resilient communities. Salvador spends his days working in Washington, D.C., as an investment banker and consultant at Penserra and 32Advisors, where he helps companies build growth strategies. He’s also served as an Advisory Board Member of the Posse Foundation, a college access organization, where he saw firsthand how close-knit social circles — “posses” — could transform the lives of students and their communities. 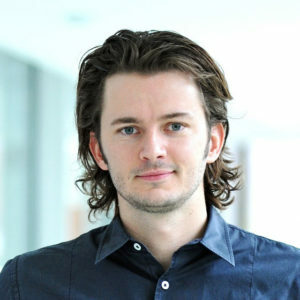 Stephan Waldstrom hails from Belgium (via Denmark), and is the Director of Risk and Product Development at RPX Corporation, a risk management company based in San Francisco. Stephan is passionate about all things product development. And he’s ready to use that passion to give back to his community. Stephan believes that “MAF has found a simple yet powerful model that can significantly improve the financial security of its members and potentially countless people across the U.S.” A product guru at heart, Stephan is excited to get his hands dirty helping MAF develop the first-ever Lending Circles mobile app, a new tool that will connect clients with on-demand loan information. 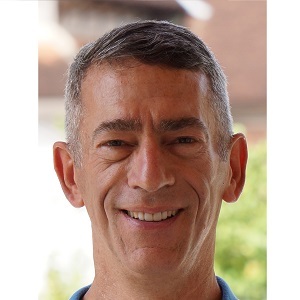 In addition to his Board seat, Stephan is lending his expertise as a member of MAF’s Technology Advisory Council — which helps guide the design of the technology that powers MAF’s programs. We’re happy to welcome Dave, Salvador, and Stephan to MAF’s board. And we’re grateful to them for sharing their collective skills and talents to as we chart new courses — from the mobile app, to our Lending Circles Summit, to new research shaping our understanding of financial health. Adelante!